Carlos Dunlap left the game late in the fourth quarter with a chest injury and did not return. The game was well out of hand by that point, so the team could have just been being conservative. We should know more about his status after the Wednesday practice reports are released. Gerald McCoy left the game in the first quarter with an arm injury. Initial reports are saying that he has a torn biceps. If true, this would be the third time in his career that McCoy had suffered this injury. And he would miss the remainder of the season. A.J. Klein pulled a groin during the Saints' Thursday Night loss to the Falcons. He's expected to "miss some time." Both Bobby Wagner (hamstring) and K.J. Wright (concussion) were forced from Sunday's game with injuries and did not return. They will both be questionable heading into Week 15. Zach Brown was seen in tears after being carted off the field in last week's game. Although the injury initially looked season-ending, the team is saying that's not the case and that Brown may just "miss a game." Pro Bowl safety Landon Collins injured his ankle in the 4th quarter of the Giants' game against the Cowboys. He was spotted in a walking boot after the game. No timetable for his return has been determined yet, but I would have to imagine he's going to miss this coming week's game. Kenny Vaccaro has had a solid season but just can't seem to stay healthy. He re-aggravated a groin injury in the first half and was removed from the game. DE/LB Eric Lee played 100% of the defensive snaps with Kyle Van Noy out. Elandon Roberts also played about 75% of the snaps. Lee is classified as a DL in some leagues. If that's the case, he makes for a very nice "cheat code" at the position for as long as Van Noy remains sidelined. Deone Bucannon returned to the starting lineup after missing a week due to injury. There was some concern he would lose snaps to Josh Bynes in subpackages but that didn't happen. Bynes instead stole share away from veteran Karlos Dansby. Despite playing full-time however, Bucannon only managed just two total tackles. His production should improve next week as he continues to get near full health. Both Vincent Rey and Jordan Evans saw ~90% of the snaps with Nick Vigil and Vontaze Burfict out with injuries last week. Christian Jones' snap count plummeted to ~20% this week with Nick Kwiatkoski receiving 85% of the snaps. This seems to be a fluid timeshare and is a situation I would avoid for the fantasy playoffs. Vince Williams played 83% of the defensive snaps with Ryan Shazier and Tyler Matakevich out. I would expect that percentage to hold steady even when Matakevich returns. Kelvin Sheppard played every down on the weak side with Jonathan Casillas still out with an injury. Calvin Munson played 80%+ of the defensive snaps in the middle with B.J. Goodson once again sidelined. After a couple of monster games, Vonn Bell has come crashing back down to reality in recent weeks. Much of that decrease is a result in a change of role for him as he's seen less snaps with Marshon Lattimore and Marcus Williams back. He could see a slight bump if Kenny Vaccaro misses any time but he remains a boom/bust option. Up until this week, Daniel Sorensen had been one of fantasy's most consistent safeties. This makes his two solo performance in the fantasy playoffs that much more disappointing. Keep in mind though that the Chiefs only saw 11 rush attempts and very little tackle opportunities in general as Kansas City dominated the time of possession on offense. He should rebound next week. DE Ezekiel Ansah (DET) - Ansah has struggled with injury and consequent ineffectiveness since his 2015 breakout campaign in which he logged an impressive 14.5 sacks. Outside of a big, three sack game in Week 2, Ansah had struggled in the box scores for a majority of the season. He's come on in recent weeks however with 13 solo tackles and 2 sacks over his last three games. He's getting healthy at a pivotal time for owners and makes for a nice high upside play against the Bears in Week 15. Consider him a DL2-. DE Jurrell Casey (TEN) - Casey failed to register a sack in Weeks 12 or 13 despite two very favorable matchups. This caused his ownership percentage to plummet. He did bounce back with a two-sack performance again a very sackable Arizona team and is worth a look again this week in another favorable matchup against the 49ers. He's a decent boom/bust DL3. DE Michael Johnson (CIN) - Johnson broke through with a two sack performance against the Bears last week. His snap count percentage has risen above 75% in recent weeks and he would figure to take on a larger role if Carlos Dunlap couldn't suit up this week. The matchup against the Vikings isn't great but they did give up six sacks last week. Plus, picking are slim this time of year at the defensive line position. LB Craig Robertson (NO) - A.J. Klein looks like he's going to miss some time with a groin injury. This bumps up Robertson into an every-down role. He registered 8 total tackles with Klein out last week and has shown that he's capable of big numbers when given a full complement of snaps. A similar number of tackles is a reasonable projection for him this week against the Jets. LB Michael Wilhoite (SEA) - Both Bobby Wagner and K.J. Wright suffered injuries in last Sunday's game and are in jeopardy of missing the Seahawks' upcoming game. If Wagner is out, Wilhoite would likely slide into the middle of the defense and play every down, making up an intriguing LB3 streaming option for owners in deeper IDP leagues. LB Zach Vigil (WAS) - Vigil has leapfrogged Martrell Spaight for the starting inside linebacker job in Washington. With Zach Brown looking like he might not play this week, Vigil has a good chance of racking up tackles against the Cardinals if nothing more than by default. He's available in the vast majority of leagues, so he makes for a nice, one-week pickup for those looking to fill their LB3/LB4 spots. LB Matt Milano (BUF) - The Bills coaching staff started Milano over Ramon Humber this week and the former responded with 11 total tackles (10 solos). Both teams were forced to run the ball on a vast majority of their plays due to the severe weather conditions so that inflated the tackle production of a lot of Bills/Colts players. And Milano is only playing in the base package for now. But he's still worth a look as a LB4+ for owners in desperation mode. S Sean Davis (PIT) - With 12 total tackles (2 for loss), 1 PD, and an interception, Sean Davis had his best game to date. This isn't altogether surprising given that the Steelers were without Ryan Shazier, forcing Davis to take on a stronger role in the run game. He has the Patriots on the schedule this week who have been one of the top tackle-producing matchups for opposing safeties this season. He should be one of the stronger defensive back plays this week. CB Desmond King (LAC) - King has been one of the top fantasy corners over the last two months, so he's likely only available in moderately shallow IDP leagues. The Chargers are using him to blitz a lot out of the slot which has translated to him compiling a ridiculous four sacks over his last six games. He's averaged a very solid five solo tackles during this time frame as well. The one downside is his plays the Chiefs this week who have given up the least amount of points to opposing cornerbacks so that downgrades his value a bit. Consider him a top 30-40 DB this week. CB/S Quandre Diggs (DET) - I mentioned Diggs last week as a sneaky play in CB-required leagues as he's still classified as a corner despite starting at strong safety for the Lions. He came through in spades for owners that picked him up last week as he went 6-1, a forced fumble, an interception, and a pass defensed. 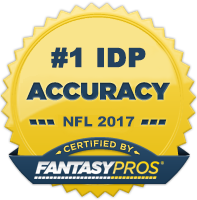 He has a top 10 matchup against the Bears this week, so he should be in your lineups in most leagues that force you to start a cornerback.